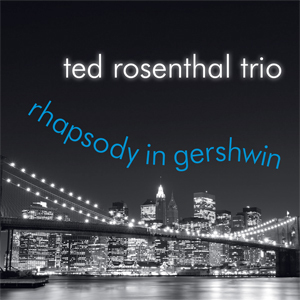 Playscape Recordings is proud to release Rhapsody in Gershwin (PSR#071613), lead by veteran pianist Ted Rosenthal, along with his flagship trio, featuring bassist Martin Wind and Tim Horner on drums. On Rhapsody in Gershwin, his 6th release with Playscape Recordings, Rosenthal pays tribute to eight of George Gershwin's most popular compositions beginning with an extended trio arrangement of "Rhapsody in Blue". "I like to add some of my own jazz improvisations in the cadenza sections," Rosenthal writes in his liner notes. "Since Gershwin himself did not have the time to write down his solo cadenzas at the premiere, it's a natural way for me to expand and personalize the piece." Additional arrangements include Gershwin's witty "Let's Call the Whole Thing Off" and "Someone to Watch Over Me," among others. Rosenthal's 15th release as a leader, "Rhapsody In Gershwin" utilizes the basic trio format to pull off the orchestral splendor of the original intent with tons of jazz shadings in eight standards. They form an organic group that sounds like they were born to play together. "Rhapsody in Gershwin" is a very special musical treat. Complex rhythms, lightning-quick runs, distinctive harmonization, melodic fluncey, and inventive improvisations make Rhapsody In Gershwin a refreshing approach to classically familiar material. This is a exceptionally well-conceived album, certainly one of Rosenthal's very best, and a fine salute to Gershwin. Rosenthal has used the term derangements to describe his versions of Strike Up The Band and Love Walked In, and in both cases, the interaction of three brilliant musicians adds new vibrancy to an old chestnut. Ted Rosenthal is a polished pianist with eloquent flexibility. This cat and his band sure can swing. Rhapsody in Gershwin is small ensemble jazz at its transformative best.